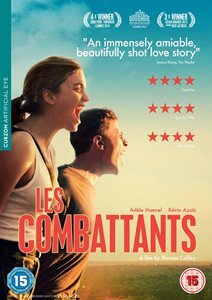 Winner of three prizes in the Cannes Directors’ Fortnight sidebar last year, Thomas Cailley’s debut feature Les Combattants is an expertly handled and brilliantly performed feel-good comedy with an original twist. Arnaud (Kévin Azaïs) is a mild-mannered, angst-free young man who’s looking forward to a summer hanging out with his friends and working with his brother to learn the family’s carpentry trade. Even his father’s recent death doesn’t seem to have unduly bothered him. Disgruntled at the high prices the funeral parlour charge for inferior wood coffins, he and his brother set about making their own coffin for the old man without further ado. The smooth progress of the summer is disrupted however as Arnaud meets Madeleine (Adèle Haenel) when he has to wrestle her at an army recruitment event. Almost bested and having to resort to a dirty move, Arnaud is horrified to find she is the daughter of some potential clients who want a shed built. While Arnaud gets on with his work he increasingly comes into contact with the eccentric Madeleine and is increasingly fascinated by the young woman. She, of course, is completely indifferent to him and is instead obsessed with training herself to a state of peak readiness for the toughest parachute regiment in the army, and perhaps for the apocalypse to come. This training includes swimming with her backpack filled with roofing tiles (a “combat swim”) and eating raw sardine smoothies. Much of the humour of the first half comes from Madeleine’s utter fixation on her goal and Arnaud’s bafflement that he is so obviously falling for her. Their tentative friendship looks doomed when she sets off for a boot camp in preparation for joining the army later that year. Not to be left behind, Arnaud abandons the family business and all his commitments and signs up for the training course. Co-written with Claude La Pape, Cailley’s screenplay is witty and yet is also aware of the need of its characters. The two leads fill out their roles well. Azaïs is essentially the straight man of the piece, but has an instant affability which keeps the character away from mere blandness. Haenel, in the broader comic role, has more opportunity to grab the laughs and steal the scenes and she does everyone, rarely allowing us to see past the edges of her character’s obsessions. Her blank glare of incomprehension when Arnaud says anything remotely normal teeters on the verge of madness. The eventual romance is played out without any inconsistent twists, allowing Madeleine to remain Madeleine even as she decides on a new way to pass the time. Minor character also get well-wrought roles. Nicolas Wanczycki – as Lieutenant Schliefer – is perhaps the standout as the boot camp commander who fails to come up to Madeleine’s high standards, is a thumbnail sketch of military narrowness and pomposity. Cinematographer David Cailley (the director’s brother) captures the summery look of the southern French town, whilst also suggesting a lingering foreboding – a torrential rainstorm, a column of smoke in the distance – that might justify some of Madeleine’s fears and predictions. Towards the finale there is a sense that something more serious may be afoot, but ultimately Les Combattants isn’t aiming to unearth anything deep or political. Rather, it’s a funny and entertaining comedy about falling in love – and surviving.